Once approved for a promotion Influencers will notice an or icon in their dashboard. The icons are there to give you a quick recap of what needs to be done. If there are special instructions or anything out of the ordinary it will be added to the bottom of the pop-up. You’ll see a special instruction icon if the business has something specific needing to be done in a particular fashion. As you can see below additional instructions are added giving the influencer clear instructions to live every week like it’s shark week 🙂 Make sure you follow these instructions to receive payment for your sponsored posts, if applicable. The instructions icon is the same as the special instructions without the additional information. 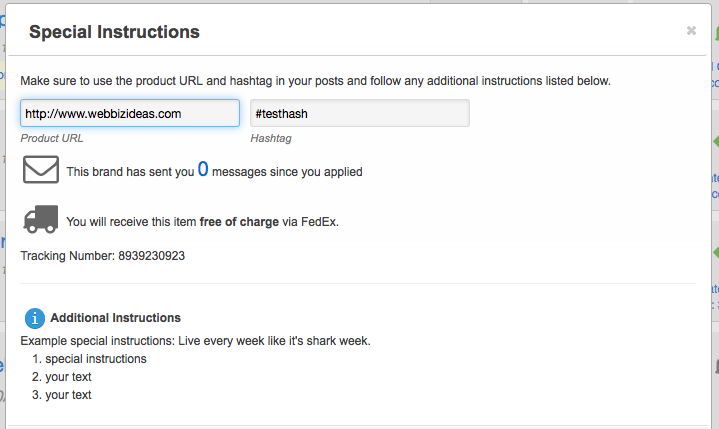 It will still show product url, hashtag, number of messages, and shipping method as seen below. IMPORTANT: in either case if a coupon code is involved it will be shown in the special instructions and instructions pop-ups.